New Technologies, Techniques, Methods and Strategy Designs And More. The Methods, Techniques and Strategies Design Award is a concealed design award category, open to submissions of new technologies, techniques, know-how, methods, very short-term trade secrets, strategy designs and similar information which needs to be kept secret up to 3 years. This category has especially made available for companies who wish to join and test themselves with their participation to A’ Design Awards, and who, do not yet wish to get their designs and projects published online or made available publicly. 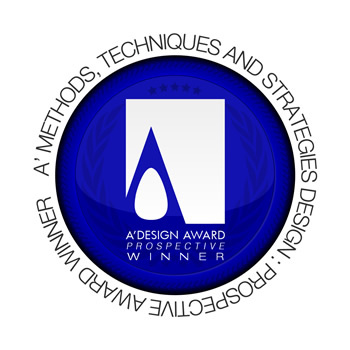 Participation to the methods, techniques and strategies design award requires the addendum to the terms and conditions to be also accepted. To learn more about concealed design award categories, please click here. A1. Even though the category is concealed, the entries could be visible after 3 years. Participants reserve right to have their entries made visible earlier through category change service. Alternatively, participants could request for disqualification within 3 years. A2. Award winners in this category will not receive any services that would make the designs and their details publicly visible. The following are given as example services that award winners will be excluded: Yearbook participation, exhibition participation, pr-campaign, press releases, pr-distribution etc. However the following could potentially be visible to public: “Project name, category name, primary function, designer name, and small thumbnail image”. A3. Detailed score sheet is not available for concealed design award category winners. The award jury could be composed of less people when compared to other categories. A4. Awarded entities declare, once again, to not to use the award logos and certificates for other products or brands they own. Awards are design bound and can only be used for the awarded product. If product, design or service specifications change, the logo cannot be used for that product any longer. A5. Even though A’ Design Awards and Competition takes reasonable precautions to prevent access to the hidden documents, we cannot guarantee 100% security and secrecy. In case of an illegal breach or access to the competition platform, design details could be captured by 3rd parties. In this case A’ Design Award & Competition cannot be held responsible for any damages. A6. You cannot especially submit state or government secrets, or any other top-secret trade secret that could potentially create heat for A’ Design Award & Competition. If you submit such secrets, A’ Design Award and Competition keeps the rights to release their details to prevent harm to itself and their agents. A7. Even though your entry is labeled secret and hidden, in cases where publishing your design details is required such as requested by law, or due to other external threads, we reserve the right to publish the designs in any case. When submitting to the Methods, Techniques and Strategies Design competition keep in mind that your submission will be evaluated mostly on the overall design of the system, its efficiency and added value created by introducing the design elements. Methods, techniques and strategies design competition winners are selected according to functional and emotional aspects of the system, overall system efficiency and improvement; entries are further considered for their degree of innovation, aesthetic qualities, functionality and usefulness in addition to ease of realization and application efficiency, and other project specific categories. To apply your product, packaging, design or service for the methods, techniques and strategies design award category, simply upload your design regularly and choose the Methods, Techniques and Strategies Design Award Category from the category list during nomination. Please especially remember and note that, entries will be concealed up to 3 years only. After 3 years, entries will become publicly visible and they will also be visible online. This condition is especially put forward to push any latent development, and to ensure that the awarded companies and awarded products would be verifiable in future. Award winners will be able to use a title that matches their nomination category: Such as "Methods Design Award Winner". Previous winners for this category are not publicly displayed and winners are listed as "Prospective Winners" until the results are public within 3 years. However, validation service is possible. Please contact us to verify if a service or product is indeed a winner or not.